Under the ReM Framework, projects are given overall ratings as part of the appraisal process. Ratings are based on a series of objectively measureable indicators and guidelines. A process of quality control ensures that all ratings are checked for consistency across operations. Pillar 1: In 2017, all new projects were rated at least “good” under Pillar 1, signifying that they are in line with Mandate objectives and make a high contribution to either national development objectives or those of the EU, and a moderate contribution to the other. Just over half were rated “excellent” for making a high contribution to both EU priorities and national development objectives. Pillar 2: The Pillar 2 rating is based on project soundness, financial and economic sustainability and environmental and social sustainability in the case of directly financed projects. For intermediated operations, the rating is based on the expected results, weighted by risk considerations as measured by the soundness of the intermediary and the quality of the operating environment. With reference to the overall Pillar 2 rating, 85 projects were rated “good”, with an average economic rate of return (ERR) of 10% to 15% in the case of infrastructure projects. Eight projects were rated “excellent”. These covered a range of sectors, including two projects in the water and wastewater sector. Another six projects across all sectors received an “acceptable” rating, often because of high-risk environments or lower capacity of the project promoter that could impact the probability of achieving planned results. The two microfinance credit lines in Georgia and Palestine are notable in this category. 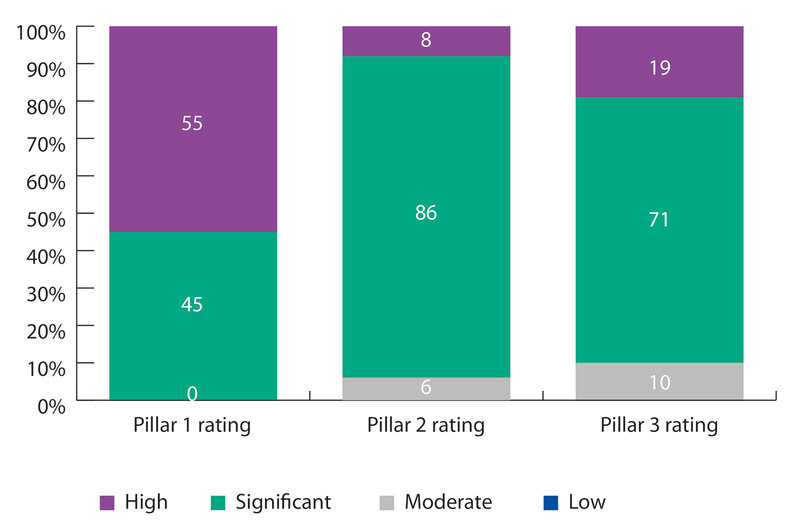 Pillar 3 ratings are presented in the chapter on EIB contribution. Human rights – the EIB is bound by the Charter of Fundamental Rights of the EU, including the commitment to upholding human rights; this is achieved by excluding specific types of projects or activities, and by a comprehensive due diligence process. Gender – in line with the Bank’s Gender Action Plan, the Bank is mainstreaming gender equality and women's empowerment in its lending portfolio, both through standards-based due diligence and lending impact. Conflict sensitivity– the EIB approach focuses on flagging and mitigating conflict-related risks to avoid aggravating conflicts and, whenever possible, contribute indirectly to conflict prevention, recovery and peace-building through its operations. Biodiversity – the EIB is committed to tracking and reporting biodiversity-related lending and is working with other development banks on a common methodology. Climate change – The EIB’s climate standards require its financing as a whole to be aligned with EU climate policy. This is done not only by promoting climate change mitigation and adaptation projects, but also, for example, by mainstreaming climate risk considerations and assessing the Bank’s carbon footprint across the portfolio. Marginal: Not Acceptable, for environmental and/or social reasons – not suitable for EIB financing. Acceptable: Acceptable with major negative residual environmental and/or social impacts. Good: Acceptable with minor negative residual environmental and/or social impacts. Excellent: Acceptable with positive or neutral residual environmental and/or social impacts. Ratings for the assessed projects outside the EU ranged from “2” (seven projects) to “4” (six projects). Sector average ratings were similar across most sectors at around 3. 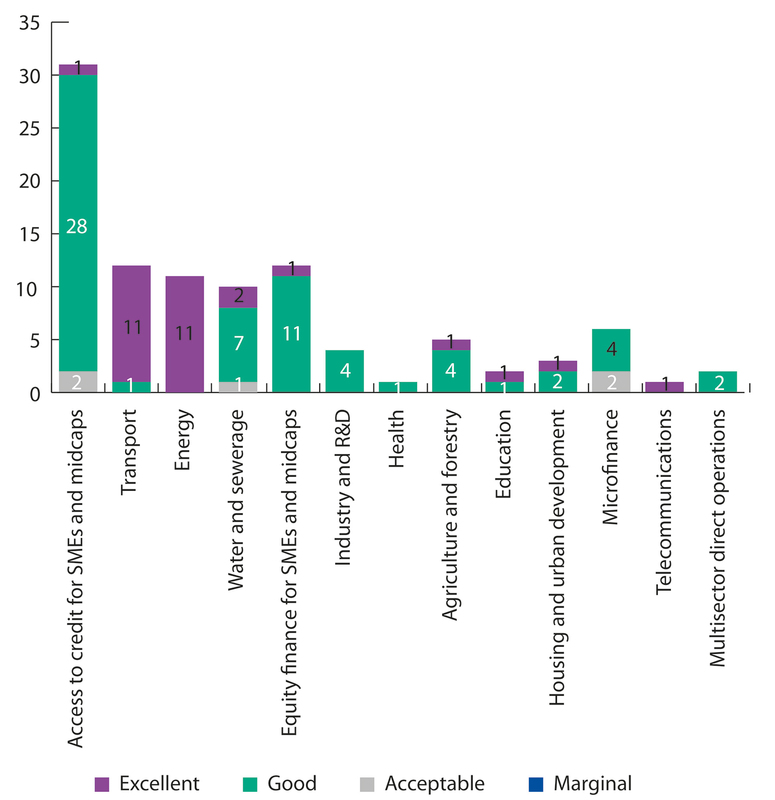 Transport and agriculture projects, which often affect a relatively large area, appear to raise more environmental and social issues on average, necessitating heightened attention to mitigate risks.